These diary entries made fascinating reading for me. Written before C.S. Lewis came to faith as a Christian, they shed light on the Christian-who-is-to-be in Lewis. A non-Lewis-ite probably would find them tedious and a bit odd, but I thoroughly enjoyed them. 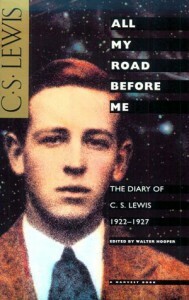 I also read the diary entries of Lewis' brother, Warnie, from the book "Brothers and Friends". Reading about the same event from both brother's differing perspective was really enjoyable!At the back of the diary are prose sketches of men that Lewis worked with and for and around while an undergraduate at Oxford. These are delightfully written and show both the righteous and the wicked. When you read "That Hideous Strength" you will see some of the characters in that book were pulled from these prose sketches.